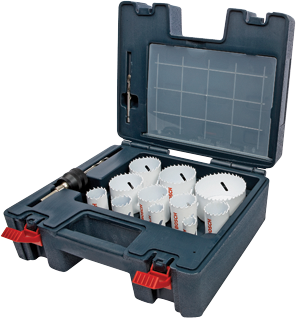 A complete assortment for general-purpose applications. Quick Changemandrel (PCM38) with two pilot bits (HB85PB). Four small adapters (AN01) and seven large adapters (AN02). Hole saws: one 3/4 In, one 7/8 In, one 1In, one 1-1/8 In, one 1-3/8 In, one 1-1/8 In, one 1-3/4 In, one 2 In, one 2-1/8 In, one 2-1/2 In and one 3 In.